I've been a little remiss in posting these finds. Blame it on summer? Our local public radio station did a piece earlier this week on summer seasonal affective disorder (SAD). The gist of it was that SAD is just as likely to hit Phoenicians in July and August as it is mid-westerners in February because we are stuck indoors just as much as those shoveling snow mid-winter. I don't think I need antidepressants to deal with Phoenix summers (yet; ask me next month when everyone else has moved on to pumpkin spice lattes and it is still well above 100 here). But I do my best to get out of here as often as possible in the summer months. I'm limited by my chemo/lab schedule and our budget, but we get creative. Tag along when Chris has a conference in Portland in August? Sign me up. Drive to San Diego to stay with friends for a long weekend before Chris' semester starts again? Yes, please. If I could get away with it, I'd be a total snowbird. As it is, my head still thinks it's on summer vacation. Here's what caught my attention on the web the last couple of weeks. See something you think I should include here? Please send me an email. One More Reason to Limit Pasta? If only I knew whether my tumor tissue had the IGF-1 receptor. . . I'll admit I had toast (whole grain, smothered with mashed avocado and a drizzle of olive oil) for breakfast, and we eat pasta or pizza in our home about twice a week. I haven't changed my diet much since my diagnosis, since I've always aimed to eat pretty healthily. Tell me, how has your diet changed (if at all) because of cancer? 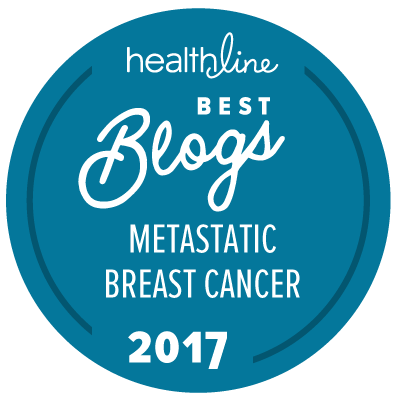 "The breast cancer risk for women younger than 40 with PALB2 mutation was eight to nine times as high as that of the general population." Guess what I'll be talking to my oncologist about the next time I see him. A Link Between the Pill and Breast Cancer. Are You Surprised? "The pill is essential; not getting cancer is too. How do you choose what's more important—a lifetime of easy reproductive autonomy, or ratcheting down your risk of a deadly disease by marginal amounts?" You can turn off your iPad at night, but what if you work the night shift? "An important question about chemotherapy is whether resistant mutations already exist in a few rare cells in the tumour before treatment begins or whether they arise through natural selection as the cancer evolves during therapy." At the very least, please see your doctor if you think something doesn't feel right. A New Type of Therapy to Stop Metastases? "Now, the duo have developed an improved version of their compound, which they hope will eventually prevent the cancers from spreading further once they have metastasized. And because it only blocks cancer cells from landing at their intended targets - it doesn't kill any cells, cancerous or not - the substance in theory is nontoxic."